This past Thursday Metroland named Hello Pretty City as “Best Indie Rock Radio Show” of 2010! I was smiling and beaming all day! To read the little write up click here and then scroll way down! More importantly, I think of you and me and how sometimes Hello Pretty City seems like more than just a radio show. It’s a feeling…a smile…a toe tapping…a gratefulness. And it wouldn’t feel this way without you…smiling, toe tapping, and listening. I’m sad to write this to you: Today is my last show on WRPI, 91.5fm. But there is happy news: Hello Pretty City is moving to WEXT, 97.7fm and online at www.exit977.org!!! The new day and time slot will be decided soon and I will write it here when I know. I hope that the first show on WEXT will be next week. I hope you will consider coming to the Hello Pretty City concert this Friday night at Valentines. 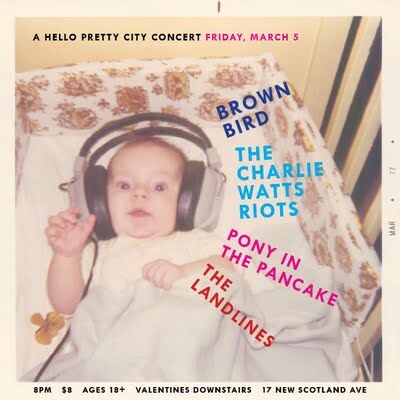 Four amazing bands will be there to help us celebrate seven years of Hello Pretty City: Brown Bird, The Charlie Watts Riots, Pony in the Pancake, and The Landlines. Starts at 8 and costs $8. It will feel good to be there! Please, kind listener, know that I’m not leaving WRPI for any reason other than my schedule is changing and I need to be at work on weekday mornings. I am truly thankful to be able to find a way to continue doing the radio show, even though it will be on another station. Sad news: My last show on WRPI, 91.5fm, will be next Tuesday, March 2. Good news: Hello Pretty City is moving to WEXT, 97.7fm and online at www.exit977.org !!! The new day and time slot will be decided soon and I will write it here when I know. Being a part of WRPI for the past seven years has been one of my favorite parts of living in Albany. I hope to keep my membership at the station so that I can do fill-in shows for other djs, as needed. Thank you for coming here to read about this change. But most of all, thank you for listening to Hello Pretty City. I don’t know you personally but I think of you when I’m on the air and out and about. I hope you’ll be able to keep listening and if you’re available, come to the Hello Pretty City concert on March 5th at Valentines.